Toroidal Transformer,by meeting today’s requirements for smaller,more efficient,quieter and safer products,are being accepted in an increasing range of electronic and electrical equipment.With toroidal transformer smaller dimensions, lighter weight and low stray magnetic fields,you can build more compact,lower cost quality products without sacrificing performance. 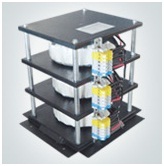 The main purpose of these transformers is used in energy saving technology which in turn enhances the performance and saving the energy. We have both in single phase and cascaded in three phase as per the utility by the customer.